Some of you may be starting your new year of Secondary School, some of you may be starting your first year of university and some of you may be finishing university and going into a job. It's scary isn't it? It's scary not knowing the kind of environment you're going to be in, it's scary not knowing whether you'll fit in and make friends and it's scary thinking about the workload you're going to get. I've just started my first year of university at Birmingham City Uni and I was petrified. Luckily, I had my best friend starting at the same time as me but that didn't mean I wasn't going to be on my own. I knew that doing the English and Media course, there would be a lot of work but I knew that I just had to get on with it. It's been two weeks since I started and I've made a group of amazing friends. I thought back to how nervous I was and decided I thought I'd share my tips on how to conquering those initial university nerves. 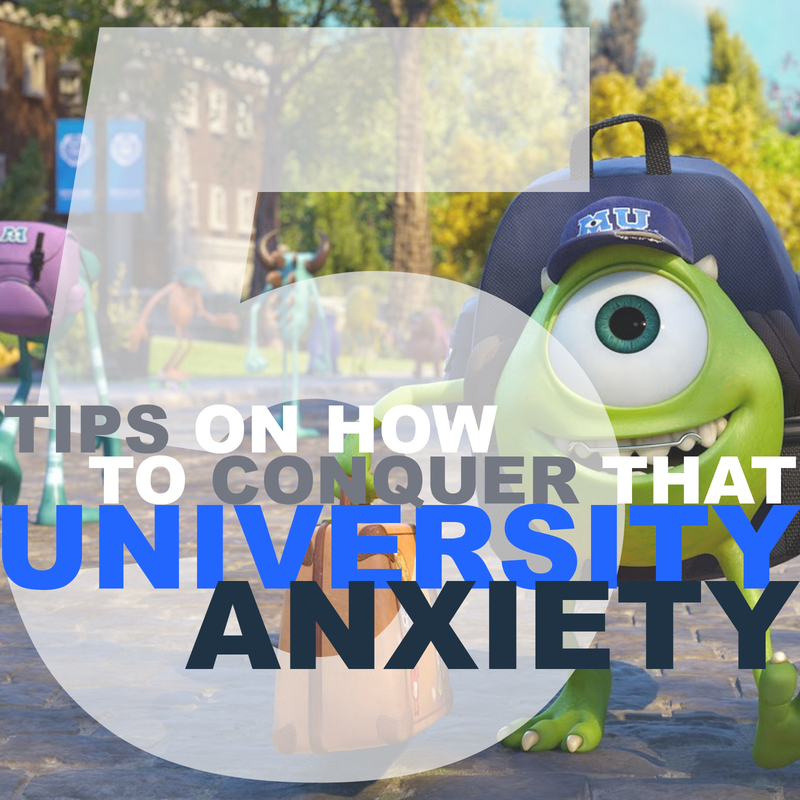 Tips that might help you to conquering anxiety at University. TV shows are also an awesome way to break those barriers. Find a TV show - or film - that you're all interested in, all squeeze into someone's room and watch it (make sure you have food!). I remember when three of my bestest friends from my last university and me squeezed into a room, sat down with tubs of Ben & Jerry's and watched I'm A Celebrity Get Me Out of Here. Looking back, that was some of the best few weeks I had there. Fresher's… Now this is a hard one. At my old university, I lived on campus so I could go to any fresher's events, any time. At Birmingham City Uni, I decided to stay at home. I've missed the fresher's events, but that doesn't mean that I missed out on any university experiences. I still made a lot of friends without going out partying. If you live on campus and suffer with anxiety, try and make yourself go to one event. Even if you turn up for an hour, at least you can say that you've been. Whenever you start university, you will have a welcome week (or 'induction' week). I cannot stress how important it is that you go to this! Sure, there aren't any lessons but that's the best time to make those friends. You will all be in the same boat and you can help each other through that first, nerve-wracking week. You also learn a lot of important information during the welcome week about your university and the activities that take place there, so please, do not miss that week. Lastly, I find the best way to conquer those nerves for university is to look ahead. Before I even started university, I had emailed my future tutor about which books we would be reading on the course. He told me the four books and during the summer holidays, I had read them all. When I started university, I didn’t have to worry about starting the reading and fitting it in, because I had already done it. Apply this to when you're at uni as well. Do the reading before you go to the next lesson, if the presentations for next weeks lessons are available, look at them and make notes. Be prepared. The more you plan ahead, the more easier you will make it for yourself. The easier you make it for yourself, the less stressed out you will feel which may help that anxiety. If you have any questions about starting university or just want a friendly chat about how you're getting on, drop me an email at kirsty.hanson@blueyonder.co.uk. I would love to hear about how you're all getting one with your new starts! Did it hold you back at University? Having not gone to university this is an interested post for me to read as my anxiety was a factor into why I didn't go.